It’s time for PonyFest13 over at Rebecca Enzor’s place! Last year, you guys (OK, so a year ago it was mostly family and friends…) voted my PonyFest12 entry into the winner’s circle. 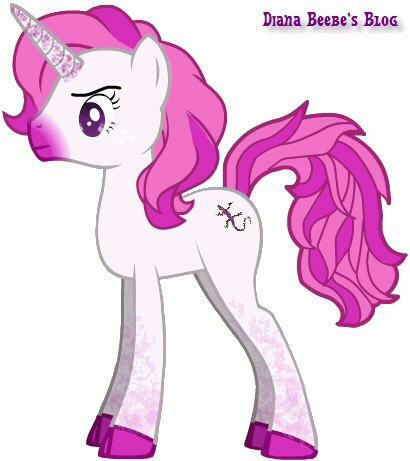 I’d only just discovered Rebecca’s blog through WANA connections and our mutual attraction to all things My Little Pony. 😀 To think, I almost didn’t enter! This year, I can’t win the grand prize again, but I could win a few awesome books if my entry gets enough votes from October 5-12… (hint, hint). I picked her brain until I got all the things that she wanted to see in a book that she would read. With a few details (and all name approvals) worked out between Bluebonnet and Mockingbird, the story was born. Two elements that had to be included were a blue Pegasus and a pink unicorn. The main characters, Sophie and Piper, learn there is more to the tiny, delicate, porcelain figurines that their crazy Aunt Lira gives them. Dude is a little bit surfer, a little bit James Bond. He’s all blue—from the palest hint of blue to his dark, iridescent hooves. Sophie can’t believe how real the painted feathers on his wings look and feel. She gets more of a shock when he grows to full size and talks to her. 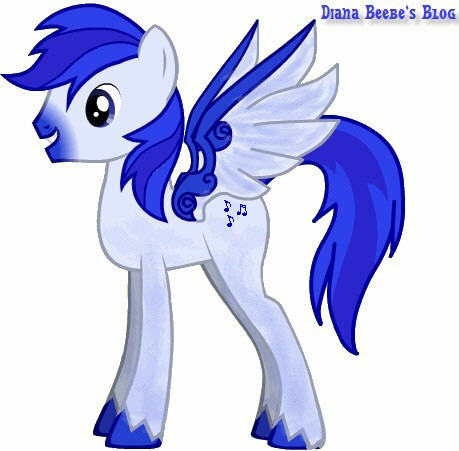 The musical notes on Dude’s cutie mark represents his bell-like voice. Dude changes shapes a few times in the story. His wings and flying skills get them out of a few scary situations. Sophie bonds with this relaxed and practical guy even though she should probably be freaking out that he’s not a figurine at all. Piper names her beautiful and delicate unicorn “Pinkie.” Aunt Lira warns her against that. Pinkie turns out to be Montesque with a baritone voice that thumps through the girls’ bodies until he brings it up a few octaves. Also, he’s a little sensitive about being called a girl. He can’t help it if he’s pink. Piper’s dreams of a beautiful girlie unicorn are further dashed when “Mo” (as Dude calls him) vomits coconuts on a black beach in Maui. He doesn’t have pockets; he had to carry their clothes in something. The cutie mark represents when he changes into a horned chameleon. Twelve-year-old fraternal twins, Sophie and Piper Dunbar, couldn’t be more different. Born on either side of midnight, they don’t even share a birthday. After their great aunt Lira moves in, she gives them a magic oboe, a pen that never runs out of ink, a pink unicorn figurine, and a blue Pegasus figurine. She announces that she is sending them to Hawaii to protect a legend from the Chaos Makers. Sophie sees trouble, but Piper sees a vacation. After being transported to ancient Maui with only their gifts, they must save a constellation and bring the time of peace and harvest. The Hawaiian gods and goddesses both help and hinder their progress. If they fail, they could be trapped as captives on the war-torn island. Worst of all, Piper is afraid that she’ll miss her dance recital. Don’t forget to subscribe to my blog while you’re here, if you haven’t already. Come on. You know you want, too.